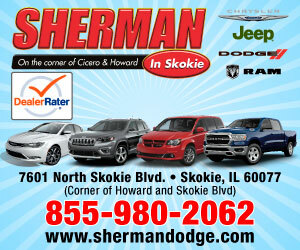 Welcome to the Sherman Dodge website, a fast and convenient way to research and find a vehicle that is right for you. Whether you are looking for a new or used Chrysler, Dodge, Jeep or Ram car, truck, or SUV you will find it here. We know that prospective customers are extremely well educated when researching their next vehicle. Sherman Dodge has made it easy to get all the available vehicle information so you can spend less time researching and more time enjoying your purchase. Check out our new specials and used specials for additional savings on your next vehicle. As a premier Illinois Chrysler, Dodge, Jeep and Ram dealer, we have a huge selection of new and used vehicles from which to choose. Sherman Dodge online and offline customers enjoy special vehicle offers every day. I noticed a sense of welcoming as soon as I entered your dealership. Friendly faces and welcoming smiles set me off at a pretty good start. I was taken care of by Tony. Tony treated me as if I was a family member and not a costumer. He made my feel comfortable with the choices I was making and the route I decided to go. I truly felt like I got a deal of a life time. thank you for your excellence! My experience has been nothing but amazing! All the work done on my car was perfect. My car needed servicing and the car needed body work. Both were great. The loner provided for me was excellent. The problem was the customer service. I dealt with Lester for the weeks/month it was there. I listed with him what the services were that it needed. When I got home after dropping off my car, I called Lester because I forgot to tell him in the building that the horn was not working properly. Lester assured me that he would add it to the list and take care of it. We spoke about five times in the times you had the car. Every time I spoke to Lester I asked about the horn. Do they know why it wasn't working right? Was it working correctly now? Lester, each time, assured me it was being taken care of. Then, when the car was scheduled to be ready and picked up. I asked Lester if it was taken care of, and he told me it was. He also said that since it had body work done, they would check it again to make sure nothing was going on in the process of body work that might affect the service. When I picked up the car on a Friday, the horn had not even been checked. It was not on the list, and it was not checked. I found that crazy since I asked Lester every time I spoke to him about the horn. I have no idea what happened. However, I am thrilled with everything that was worked on with my car.